Join us for a celebration and exploration of all things synth at the Ann Arbor Synth Expo (formerly Mini Moog Fest)! Watch performers, and enjoy hands-on activities for the whole family! Featuring performances by the Robot Rickshaw and Anıl Çamcı, along with a demo by Mogi Grumbles. 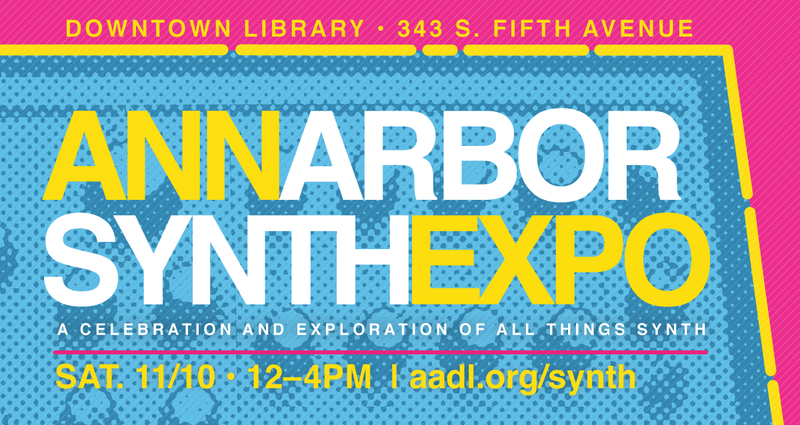 Try out various synths, including gear from AADL's Music Tools collection, talk to vendors, artists, and makers about how to construct your own sonic creations! Check out a eurorack demo from Vintage King Synth Specialist Brandon Murphy, and a raffle giveaway for a Touche SE from Expressive E! Plus gear demo and giveaways from Zeppelin Design Labs, and swag from Pittsburgh Modular, Perfect Circuit, SynthCube, Electro-Faustus, Arrick Robotics, Sweetwater and Reverb!